As your products become more complex and software becomes more integrated into the design, Safeware can work with your company to improve the system safety and software safety of any product you are developing. Safeware’s tools and techniques have been tested or used in the aerospace, defense, automotive and medical industries and are applicable to any real-time safety-critical system incorporating software. Safeware enables you to build safety into your products. We accomplish this by offering a software tool set, called SpecTRM, that allows you to build an executable model of your requirements and run various analysis before the development phase ever begins. We also provide support and training in the design of safety-critical systems, including requirements analysis and safety analysis. Please browse our services and products to see how we can help you achieve your safety-related goals. If you are new to system and software safety, we have white papers and a list of publications to help you get started. 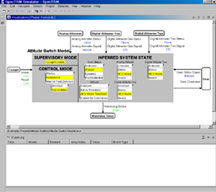 Model your system and software requirements before you design using SpecTRM. Apply the new STPA hazard analysis to your safety critical systems.